Petroleum coke is a solid that is mainly made of carbon. It is similar to coke, but it is gained from petroleum (coke is made from coal). Petroleum coke can be used as an industrial fuel, but there are very toxic by-products based on nickel and vanadium which make this problematic. 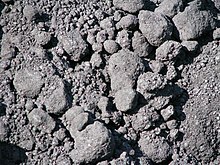 Petroleum coke is also used in the aluminum industry, and in the heat treatment of steel and iron. This page was last changed on 3 January 2017, at 19:52.